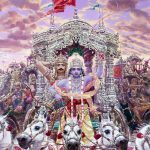 Lord Vishnu said, “My dear Lakshmi, in the town of Janasthan was a brahmana of the name Jada, who was born in the dynasty of Kaushik. 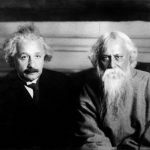 That brahmana gave up the religious activities enjoined in the shastras to be followed by the brahmana class, and took to many irreligious activities. He was very fond of gambling and drinking, hunting, and visiting the prostitutes. In this way, he wasted his wealth. He went to the northern countries on a business trip. While there, he gained much wealth and decided to return to Janasthan. After having traveled a long distance he, found himself in a very deserted place. One day, as the sun set, and everywhere became engulfed by darkness, he decided to take rest for the night under a tree. While resting, some robbers came and beat him to death, and stole his wealth. Because Jada had given up all religious activities and led a sinful life, after his death he attained the form of a ghost. 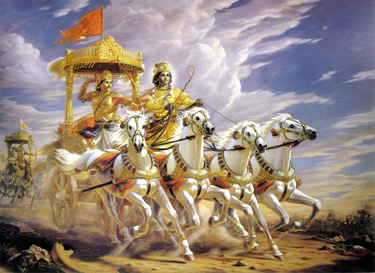 The son of Jada was very religious and learned in the Vedic shastras. When he saw that his father had not returned to Janasthan after a long time, he decided to go and search for him. For many days he traveled here and there, in search of his father, and whatever travelers he would meet, he would inquire from them, about his father. One day, he met one person who knew his father, and informed him of the events that had taken place. 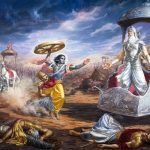 When the son of Jada heard the news of his father’s death, he decided to go to Kasi (Banaras) to offer pinda (worship) for the release of his father from his hellish condition. On the ninth day of his journey, he happened to take rest under the same tree under which his father had been killed. 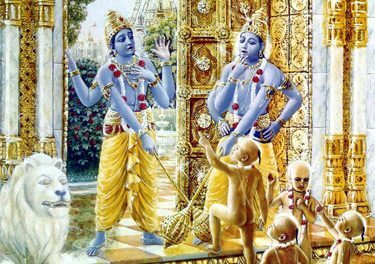 At that place, in the evening, he performed his daily worship to Lord Krishna, and he also recited the Third Chapter of Srimad Bhagavad-gita. As he completed his recitation, a loud sound came from the sky. When he looked up, he saw his father there, and in front of his eyes, his father’s form changed into one of the most beautiful beings, who had four hands, and was wearing a yellow dhoti. His body was the color of a dark rain was wearing a yellow dhoti. His body was the color of a dark rain cloud and his bodily effulgence was lightening up all the directions. At that time, his father offered his blessing to him. The son inquired from the father, as to the meaning of these wonderful happenings. 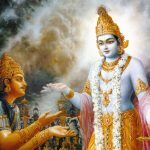 The father said, “My dear son, you recited the Third chapter of Srimad Bhagavad-gita, and thus freed me from the ghost form which I had received, due to my sinful activities. 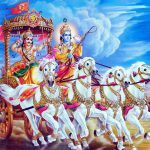 Now you should return to your home, because the purpose for which you were traveling to Kasi (Banaras) has been achieved by your reciting the Third Chapter of Bhagavad-gita”. When the son inquired from the father, if there were any further instructions from him, the father said, “My brother also had led a very sinful life and he is suffering some where in the darkest regions of hell. 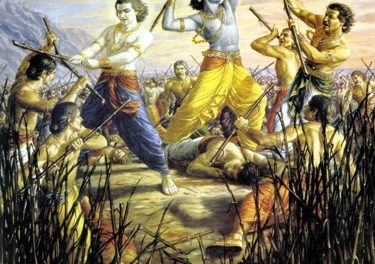 So if you wish to free him, and our other ancestors, who are suffering here and there, in different species in the material universe, then kindly, recite the Third Chapter of Srimad Bhagavad-gita. 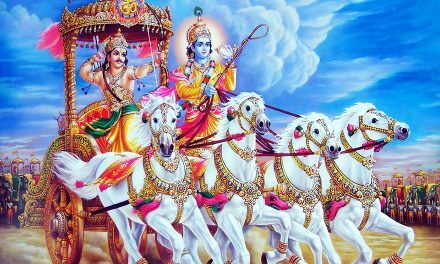 And by that recitation they will all attain a form similar to Lord Vishnu’s, and go to Vaikuntha”. When the son heard the father’s instructions he replied, “If that is the case, then I will recite the Third Chapter until all the souls, who are trapped in the hellish life, are freed” At that time his father blessed him with the words, “Let it be.” Then an airplane arrived from the spiritual world of Vaikuntha and took the father to his destination.